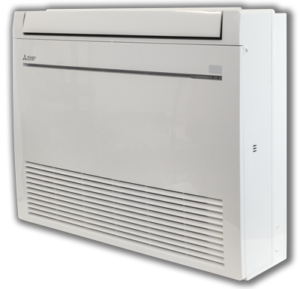 The Mitsubishi H2i Hyper-Heating Inverter™ heat pump, makes ductless a high-efficiency, year-round comfort solution for your home. Thanks to hot-start technology, these units provide warmth from the start, reducing drafts. When ductless cooling and heating units first became popular, they had one very serious limitation – they were not recommended for homeowners in extremely cold climates. Many manufacturers would recommend that homeowners who live in northern regions adopt a supplemental heating source for extremely cold days, which cancelled out the energy efficiency of the unit. Many ductless systems were actually designed to shut down at -10º F in order to protect the technology from failure. This left homeowners using expensive heat pumps, space heaters and even dangerous propane tanks to heat their homes. Technology has finally evolved and homeowners can now achieve exceptional, year-round comfort with a single split-ductless unit. These new units are able to heat at maximum efficiency no matter how cold the climate – even to -13º F.
Traditional split systems lose heat energy in the outdoor coil. Thanks to recent advances, Hyper-Heating INVERTER technology (H2i®) is able to collect that energy, helping the system to continue to operate at capacity in extreme temperatures. In cold climates, heat pumps typically experience a decrease in pressure, refrigerant flow rate and operational capacity. INVERTER technology actually allows for higher heating speeds at a lower temperature, without putting extra strain on the unit or potentially causing long-term damage to the compressor. Consistent Room Temperature – No Ups and Downs, Ons and Offs: Conventional heat pumps experience uncomfortable and extreme temperature fluctuations while INVERTER-driven pumps are able to self-adjust, providing consistent room temperature, even when the outdoor temperature dips below zero. Consume Only The Energy You Need: INVERTER zoning systems deliver only the amount of hot air needed to achieve the desired temperature – no more, no less. Heats Up Quickly: It takes traditional systems a very long time to reach the desired temperature, while the high rotation speeds of INVERTER systems allow for quick and efficient cooling and heating. Energy Use is Even and Steady: Every time the compressor turns on in a traditional unit, energy consumption surges. On startup, INVERTER systems use less current, avoiding spikes in energy usage. Homeowners who live in extreme climates have been traditionally left out in the cold when it comes to the ductless cooling and heating revolution. For decades, they have remained tethered to baseboards, propane heaters and traditional, inefficient ducted systems. INVERTER technology has finally set Northerners free, giving them the ability to achieve energy-efficient and consistent home comfort, no matter how high or how low the mercury may go. The advances in the heating performance of our units are unmatched. Our available H2i® technology can heat your space effectively even when temperatures outside are down to -13°F. 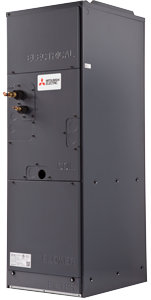 Mitsubishi Electric Cooling & Heating has introduced Hyper-Heating INVERTER® (H2i) technology, a significant advance in heat pumps. H2i uses an enhanced compressor system to deliver heat even when outdoor temperatures are as low as -13° F. You no longer need supplemental heat sources to maintain comfort or separate systems to provide heating in the winter and cooling in the summer. Hot-Start technology provides warm air instantly. amount of energy needed to maintain your desired indoor temperature. can help ensure better, fresher air in your home. Slim, wall-mounted units provide individual room comfort control. Ideal for areas that are smaller or don’t have as much wall space. 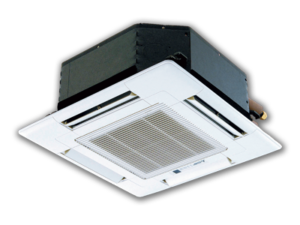 Wider 4-way airflow pattern for better air distribution in a less obtrusive style. The perfect solution for larger zones or the entire floor. (Multi-zone applications only). Choose from different styles of ductless and ducted indoor units. Our solutions can be customized for any home.